What I see here is first potential. The product is pretty good for its two and a half years. The keg has certainly contributed a lot here, but he is not really oversherried. This is indeed difficult to do with the rating, but in my opinion anything over 80 would be too much goodwill. Young liquor in the first breath, in the second already PX all superimposed, strong on the spicy side. After being allowed to breathe for a few minutes, a few ripe pears push past the sherry, which in turn becomes rounder, softer and more buttery, and also sweeter with dried fruit. Warms are roasted aromas, he smells really burned, then later musty, stale white wine, corked. Starts drier than expected, the alcohol, on the other hand, is expected to be very impetuous, having lost its initial restraint. At the back he is still very cute. In the second sip he gets a bit uncomfortable, but that's not unexpected either. At the back are beautiful chocolate notes. The finish is quite short, mainly sweet and ends with a mixture of apple seeds and corked wine. Phew, how do you rate that now? Still no whiskey, but tastes better than some Scottish single malts that I've already drunk. I would like to have it evaluated in a blank test. 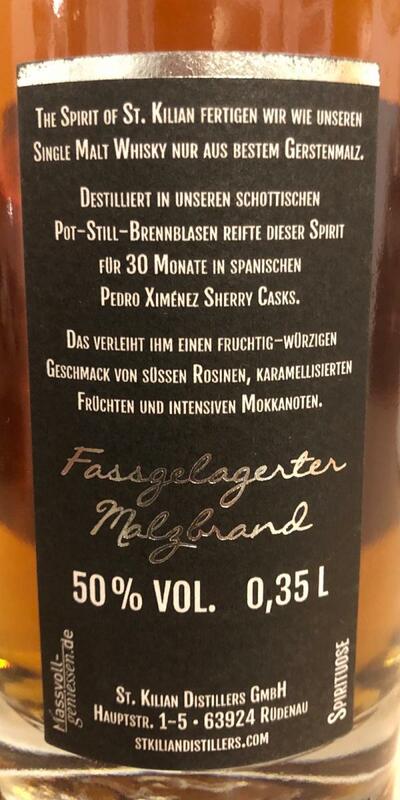 Nose: quite briefly, a very typical PX sherry sweetness, this goes very well with the malty note of the Brennereicharakters. Dark fruits, dried plums, sweet wine, some sweetened espresso and echoes of a not so old oak barrel. Almost like strong bread with plum jam. 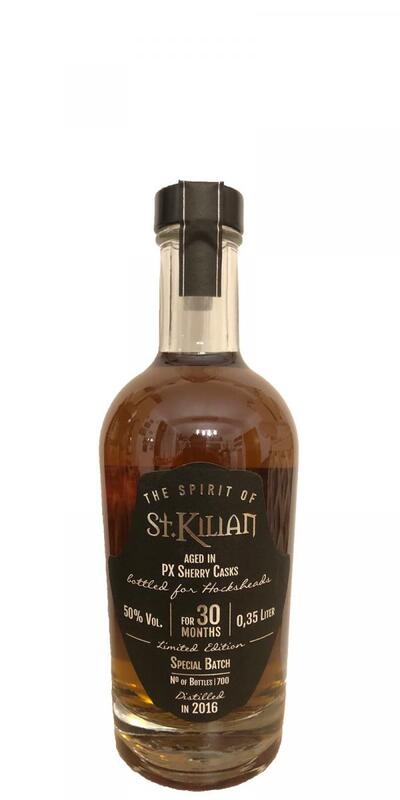 Mouth: this blend of malt and PX sherry fits surprisingly well together! The nose is very similar to the taste, in the mouth it lays like a lukewarm tea with a decent spoonful of honey on the tongue. Clear oak notes, which are saturated with sweet wine. Finish: the oak is very present! Warm, creamy, it remains relatively long throughout the mouth, with the dark fruit notes of dry oak spice soft and gradually fade away.